Make hunting more adventurous by having the right gears with you! Your hunting activity may elapse from a little time to a day. It could even go more than a day! Aside from food and water, you need the right hunting pack to cater your weapon, which could be a rifle or a bow. To satisfy your storage needs, you need the best hunting backpack to cater all the stuff you need along with your hunting journey. Also, the backpack must give the utmost comfort and proper weight distribution ergonomics for your body. Since the market is saturated with different types of hunting backpack, this factors will help you decide on choosing what you need. Most of the hunting backpacks have waterproof fabrics. Some manufacturers opt for a non-waterproof fabric but the design of their backpacks have a built-in cover. The quietness of the fabric also contributes to the quality of the backpack. Some materials may make a noise when the stuff inside touches against it. When you are in stealth mode against your target, it helps a lot when the fabric won’t emit a sound. Overall, the hunting backpack’s fabric must be waterproof, quiet, durable, and lightweight for it to be considered as ideal for hunting. When a hunting backpack is framed, it has a better weight distribution. Even if you are carrying a heavy load, you comfort won’t be compromised. In case you are going on a long hunting game, framed backpacks are good for you. But if you are on a short journey without a need of too much stuff to carry in, frameless backpacks are good for you. If you don’t know what you really need, just go for framed backpacks by default. At least you have the assurance of proper weight distribution. Backpacks with an internal frame are somehow removable yet flexible to the carrier’s back. Backpacks with an external frame are significant when the backpack is designed for higher capacity. External frames offer more weight distribution than internal frames. However, it is not flexible and follows a principle of “one frame fits all bags”. Regardless of the type of frame, it is important for you to optimize the comfort you’ll receive from the backpack. You need to take a little time to test the bag, with full loads in it, and let it rest on your body in a comfortable way. You also need to ensure a proper weight distribution throughout your body. Hunting will never be complete without a rifle or a compound bow. Thus, the backpack must have a dedicated weapon compartment to securely fit your weapon. Some bag caters rifle only, while some bag caters bows only. Some manufacturers are able to design their bags to carry both weapons in a flexible manner through straps and lashes. Some hunters only bring what they need when hunting. Some hunters bring more than what they need, even the unnecessary stuff. The latter type of hunters may just have prepared for any unpredictable circumstances. This will contribute to a decision of using small packs to big packs. Before you buy a hunting backpack, you must first estimate the capacity you need. Think of the stuff you will bring along with your hunting journey. The market is saturated with different backpacks, from cheapest to most expensive, and from lowest to highest possible capacity. This review of top 5 hunting backpacks will help you choose the best hunting backpack on your preference. What makes this hunting backpack incredibly expandable is due to an Expandable Pack Section (EPS). You have the freedom to choose between two storage needs. By default, the hunting backpack has 3300 cubic inches of storage. If you opt to unzip the EPS, you’ll get an additional 1200 cubic inches. A whopping 4500 cubic inches can surely satisfy your storage needs! This backpack has a unique “H” frame design, padded shoulder straps, and extension lashing straps which obtain a great support on the way you carry such heavy load. 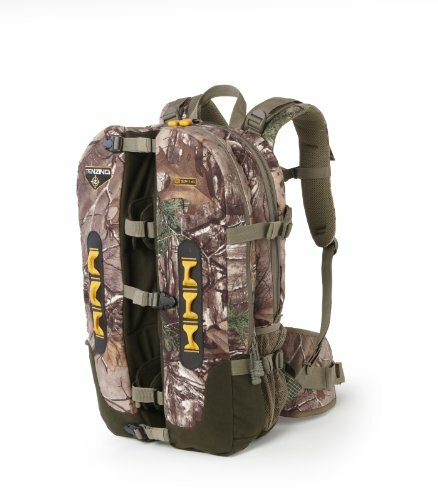 Since hunting entails a lot of action, this backpack has a hydration port and pocket which is compatible with your existing hydration pack, if you have one. In case your hunting day turns out to be a rainy hunting challenge, this backpack includes a built-in blaze orange rain cover to keep your stuff protected. The garments may have high quality which contributes to nice construction but the materials are way too heavy. Without anything inside, this hunting backpack already weighs 7 lbs. How much more if I will add my hunting stuff? I need to prepare extra strength for this. Also, my rifle won’t fit securely in its dedicated compartment when this backpack is not entirely stuffed. This backpack has two front wing pockets, one side pocket, and internal pocket aside from the main compartment. Wing pockets refer to a dedicated weapon carrying system if you have a bow or rifle. It also has a clip style holster to secure your handgun. Thus, this backpack has sufficient compartments for your organization needs. Secure fit of weapon is only possible when the backpack is fully loaded. 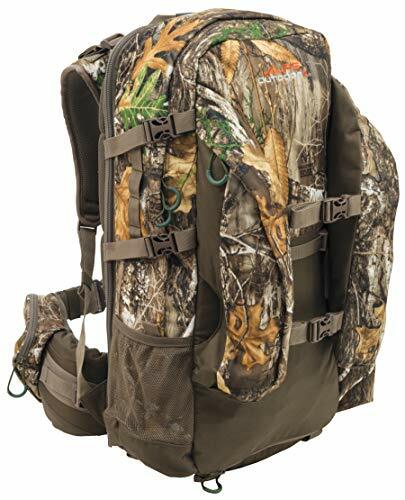 If you are on a strict budget, this hunting backpack is good to go. 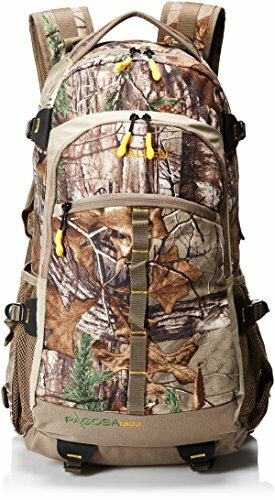 Allen Company designed this backpack for comfort and performance though the price is significantly far from other hunting backpacks. Reaching out your stuff in a gloomy weather may bring uneasiness. Thus, this backpack is designed with high-visibility linings for you to locate this backpack easily. Also, the zippers and its pulls are large and bright enough for faster and easier grip. This backpack is designed to keep you comfortable on a long journey. It includes padded shoulder straps, padded back support panels, sternum strap, adjustable waist belt, and side compression straps. The sternum strap is dedicated to keeping your stability as you take on this backpack. Also, the side compression straps concentrate the weight of the load closer to your body. For extra comfort, the back support panels are padded with cool mesh. This is not a heavy-duty backpack, though affordable. On first use, the strap ripped even when this backpack is not fully loaded. You have to be careful on unwanted rips as you may lose your stuff unknowingly. 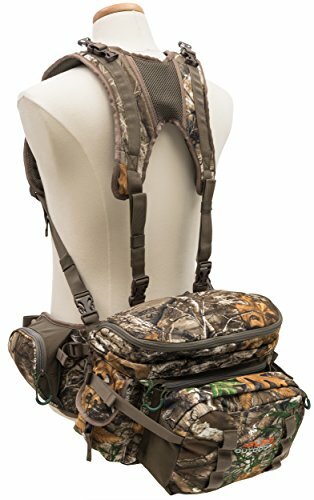 This bag is great if you are the type of hunter who only carries what you need. The 1800 cubic inch capacity of this backpack, with organizers, internal, and external pockets, is enough to keep you organized. Also, the waist belt has zippered pockets to store your important stuff. You don’t need to always take off your pack just to reach your keys, phone, and other essentials. If you are looking out for a versatile hunting pack, Pathfinder Hunting Pack might amaze you. It is composed of two packs: the fanny pack with a capacity of 800 cubic inches, and a day pack with a capacity of 1900 cubic inches. Combining the two packs, you’ll receive a capacity of 2700 cubic inches. 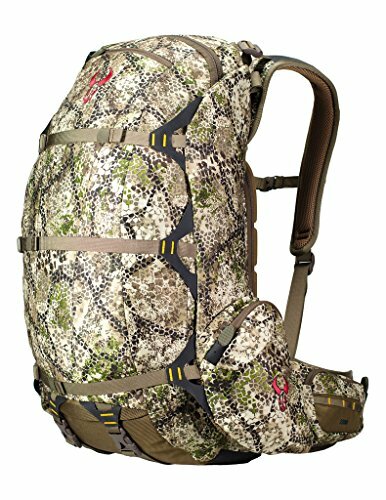 Using the day pack depends on your needs and the duration of your hunting. The fanny pack is great when you are scouting. You'll find this pleasant to use thanks to its padded waist belt and shoulder harness system. The weight of the load is also distributed properly to your body. If you need additional storage, the day pack can be unrolled from the fanny pack. After unrolling the day pack, you have the option to choose between hauling mode or bow-carrying mode. If you need the hauling mode, the daypack has an extra fabric and straps to create additional space. If you have a bow, a dedicated bow pocket is included with lash straps which secure a variety of compound bows. This backpack has a nice overall build. But it could have been better. The stitches start to come apart in just a week. Also, the nature of this pack is somewhat soft and frameless. I’m having doubts if this backpack can withstand a full load. When this backpack is fully optimized, it offers two side pockets, a front pocket, main compartment, a day pack pocket, and a fanny pocket. These compartments are enough to withstand a long journey. Nothing can beat the exceptional warranty brought by Badlands. Even if you abuse the backpack to its extremes, Badlands is ready to repair this backpack for free. This is their commitment to making products with the best quality. As long as the backpack is repairable, Badlands will keep this backpack functional to its maximum. To back up the quality, this backpack is crafted with KXO-32™ fabric. This fabric is known as the strongest, quietest, and most waterproof fabric for hunting backpacks. The designers of this backpack must have studied physics so much. This backpack is designed based on the latest science of biomechanics to enhance your body’s ability to support the load. The built-in meat shelf is made with T-6 aircraft aluminum frame which transfers the weight of the load to your hips and not to your spine. This backpack features a bat-wing design for versatility. It functions as a meat hauler and a daypack at the same time. This functionality is ideal for archers and rifle hunters. Though this backpack has a lot of compartments, it appears to have no pocket dedicated for bows. When I checked the backpack, it only comes with a rifle boot. The website of Badlands sells a separate bow boot. It makes the backpack expensive among the competition. If you are meticulous on organizing stuff, this backpack comes with 8 pockets. It also has hip belt pistol holders, rifle boot, and compressions straps. While you are carrying a heavy load, the weight is optimized for you to carry it for a long time. If you only carrying light items while you are shooting, then this hunting backpack is good for you. It features a storage capacity of 1600 cubic inches with the main compartment, two face compartments, and two side mesh compartments. It’s an enough storage for your light needs! If you are using a bow instead, this backpack features a deep center channel and specialized compression straps which can securely hold your crossbow. This backpack also features padded hip panels and built-in rain cover for utmost comfort while you are in action. The capacity of this backpack is compromised when the crossbow is already strapped. Also, the two pockets on the sides only work well when the stuff inside it is narrow. Lastly, the main compartment won’t fit a lot of stuff. It’s hard to organize well for this backpack, though it’s somehow designed for light use. You won’t have any problems optimizing the storage capacity while securely fitting your rifle. As an extra feature, this backpack can transform into a shooting rest seamlessly. When you go from stalking to aiming to shooting your target, hunting your target is made easier. When you have the best hunting backpack with you, you’ll be able to bring what you need throughout your hunting game. You must always estimate the capacity you need without forsaking your comfort. If you want to maximize your hunting activity, always equip the best gear for you! Regardless of the remarkable features, your preference of a hunting backpack still matters a lot!